"This soup should be made with fresh vegetables. Serve with a bread and cheese platter as they do in Finland. If you can't get fresh shelled green peas, use frozen tiny green peas." Heat water to boiling in a medium pot; add potatoes. Reduce heat and simmer until potatoes are tender, approximately 15 to 20 minutes. 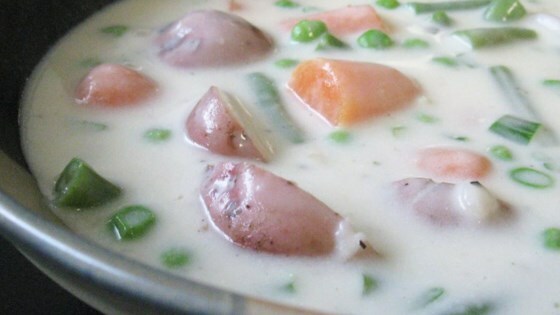 Add salt, pepper, butter, onions, carrots and green beans; simmer until tender then add peas. In a small bowl, stir together half-and-half and flour until smooth; stir into the simmering vegetables. Cook, stirring constantly until the soup is slightly thickened. Serve immediately. My family of 6 calls this a "keeper". Very good, check it out. I also added spinach and diced ham.